The apartment consists of: entrance hall, bathroom with toilet, living room with kitchenette and balcony. The property is built to turnkey stage of completion, the bathroom is fully equipped. 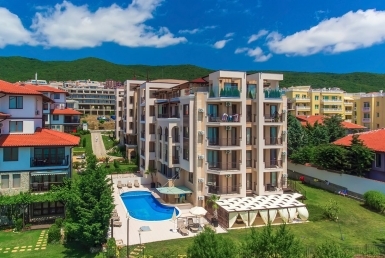 “Admiral”complex is a cozy, prestigious, “premium class” residence, which is located on the third line from the sea in the southern part of Dinevi Resort. Unique location – just 200 m away from the sandy beaches and Dinevi Marina. The complex is designed exclusively for the connoisseurs of luxury and comfort. The luxury and quality building materials, in combination with the proximity of the sea and the prestigious location, fully justify the investment in purchase of apartments in the complex. The resort offers a restaurant, several shops, an outdoor swimming pool for adults and children, a prestigious spa centre with a heated pool, various kinds of massage, saunas, Turkish bath, Jacuzzi, a beauty salon, a fitness centre, a conference hall, a three-level underground parking place. The apartments are finished to turnkey stage of completion with fully equipped bathrooms – new owners will only have to furnish their new home to their taste! The luxurious Admiral complex is divided into two sections – section A and section B – it offers 106 apartments. Most of the apartments have sea views. Parking spots in an underground garage are sold in the complex! In addition to the desired destinations for you and your family, Admiral complex has an excellent investment potential and provides an opportunity for a good rental income. 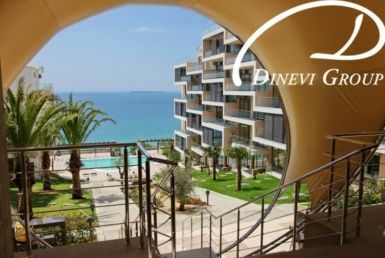 In immediate proximity to the complex you can find shops, restaurants, cafes, beauty and spa centres, amphitheater and many other amenities and attractions offered by Dinevi Resort.